Fine Print: I was given tickets and Disney On Ice is giving additional tickets to a winner. All opinions and statements above are my own. Disney on Ice is back and I’m super excited! This time around we get to watch “Princesses and Heroes” at the United Center in Chicago. Here are all the details! Playing United Center Sept 10-14, 2014 – Enter a world of wonder where heroes and hearts prevail. Join Ariel as she yearns to explore the world above the waves and Prince Eric breaks Ursula’s slithering spell to reclaim his one true love. See Prince Philip defeat the evil Maleficent as she transforms herself into a fire-breathing dragon in a race against time to rescue Sleeping Beauty’s Aurora. Be there to discover a whole new world with Jasmine and Aladdin. And, watch in awe as the dreams of Cinderella, Belle, Snow White, Rapunzel and Tiana all come true. High flying jumps, daring acrobatics, breathtaking skating and lovable Disney friends are just a wish away! 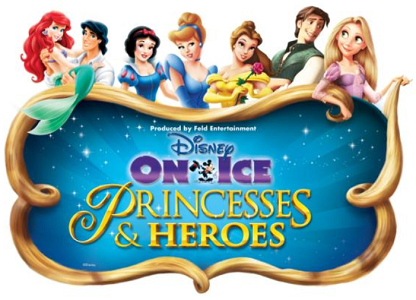 See Disney On Ice presents Princesses & Heroes where believing is just the beginning! Weekday shows include Thursday evening and Friday matinee shows and weekend includes all shows Friday evening through Sunday evening. Savings offer not valid on Front Row or VIP Seating. No Double Discounts. Service Charges and Handling Fees may apply. And as a HUGE bonus, there is FREE PARKING IN ALL OFFICIAL UNITED CENTER LOTS WITH TICKET PURCHASE. Yes, FREE PARKING at the United Center! If you’re not familiar with the area, that’s HUGE! Check out the Youtube video to get an idea of what fun you’ll see! To get everyone excited about the return of Disney On Ice, I am giving one lucky winner four free tickets to the Wednesday, Sept. 10 OR Friday, Sept. 12 performance at United Center (7pm). Your choice! To enter this giveaway, complete any or all of the options listed below. Giveaway ends 8/23. Good luck! Definitely Ariel is my favorite – loved her since I was little. My fav Disney princess is Mulan but my daughter loves Aurora!